"There have ALWAYS BEEN false prophets, wars and rumors of war, famines, pestilences and earthquakes..." some will claim. "It's nothing new." How can you KNOW whether this really IS the end-time generation? Can you PROVE it? "THERE HAVE ALWAYS BEEN..." is a catchall phrase used by those who scoff at Bible prophecy. Wars, famines and disease epidemics are nothing new. They have always been with us claim the skeptics. Earthquakes and other natural disasters occur in cycles and are based on the "law of averages," they assert. So when someone can't believe that anyone in the 1970's would be so incredibly unaware, uneducated, unscientific, and unintelligent (other than a Bible-belt fundamentalist) to think in terms of the literal (not figurative) "end-time generation," "last days," "great tribulation," etc., we must understand his feelings. As a matter of fact, Peter prophesied of precisely this approach in II Peter 3:3-4, followed by a powerful description of what would happen thereafter. But if someone can't see it yet, it's not his fault. We fully admit that it takes a certain amount of perception and savvy to scan through the usual news reports of local murders, national politics and international gossip and to be able to locate, collate, and correlate the significant happenings of our time. Then to go further and to understand what the trends mean when projected forward into the future takes a mind well-versed in Bible prophecy — which is a pretty accurate description of many of the more than 2,000,000 readers of this magazine. And, of course, we are very grateful that our inner family of TOMORROW'S WORLD readers does believe that this generation is the end time. Not for our good — but for theirs! Yet even the full 2,000,000 are but a small fraction of the world. And it is the whole world that we are commissioned to reach. There is one statement in the Bible that is beyond refute. In the year 1971 it stands unequivocably above the convenient ploy of academic argument. It must have sounded utterly absurd to that small audience about 1940 years ago. It sounded just as absurd to an audience about 37 years ago, in 1934, when Mr. Herbert W. Armstrong first began to preach it to the world. Yet suddenly, some 11 years later, in the year 1945, it began to make sense. Today it makes full sense. Today, everybody knows. Today, right now, it is being repeated across the length and breadth of the United States and on around the world. Scientists and heads of governments alike are proclaiming it. And as they do, they are unwittingly "usurping" the responsibility of the theologian. Because what they are in fact doing is paraphrasing Matthew 24:22: If this time of world trouble is not cut short, not a single human being will be saved alive. Never before in history has man been able to literally exterminate every human being on earth. Not just a large part of the enemy's army, not even most of the opposing civilian population — but every last man, woman, and child on earth: in Canada, Australia and South Africa; in Honduras, Peru and Chile; in Indonesia, Southeast Asia and Korea; in Manchuria, Iceland and Antarctica — all over the world. We've all heard the gruesome statistics that there are enough nuclear weapons stockpiled right now to kill every human being 5, 10 — or is it now 50? — times over. Then, in addition, to finish everything off, the world would be made so radioactive that no living thing, human or otherwise, could survive. And all of this was before MIRV — the Multiple, Independently-targeted Reentry Vehicles — which multiply the number of nuclear bombs that every ballistic missile can carry from one to three to ten! "There have always been 'ultimate weapons,' " retort the skeptics. Axes, bows and arrows, gunpowder, rifles, cannons, machine guns, tanks, etc., are all brought up as "pseudo-ultimate weapons" of the past. So how can we in God's Work be so sure that nuclear weapons are really THE ultimate weapon — which they must be if we are to prove that today is the end time? 2 ) Nuclear weapons work by exploiting the most fundamental physical law in the universe — the equivalence and interconvertibility of matter and energy. The hydrogen bomb works the same way the sun works! All future "ultimate weapons" could only be refinements of this basic process — they would still have to work on the same basic equation: E (energy) = M (matter) C2 (the speed of light squared). Sooner or later this argument always comes up. It goes something like this: "Nuclear weapons will never be used. Each side, the United States or the Soviet Union, for example, knows that the other side has the same incredibly destructive capability. And in any nuclear exchange, the entire world (which happens to include both sides) would be devastated. Consequently, this 'balance of power' [or, more accurately, a "balance of terror"] will maintain the peace. Neither side would ever dare precipitate a nuclear exchange. A solid precedent in this regard was set during World War II when both the British and the Germans had vast stores of poison gas, but neither side used them because each knew the retaliatory capacity of the other side." 1 ) Nuclear war by accident is a frightening reality. 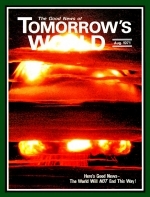 Considering the accumulation of nuclear weapons, the proliferation of countries in the nuclear club, nuclear bombs inadvertently dropped from aircraft, the unidentified blips on radar screens, wrong messages flashed on wires, off-course missiles, etc., the statistical "improbability" of an accidental nuclear war is tragically no longer so "improbable." 2 ) The "balance of terror" theory is founded on the axiom that the men in control of every power, the men whose fingers rest on "the buttons," are, if nothing else, rational. Now, while the great majority of world leaders today are indeed rational, we are not dealing with a democratic procedure. All we need is one irrational leader in one country which happens to possess a nuclear capability. And then, even though all the rest of the world's leaders are perfectly rational, this one man can trigger the feared chain reaction of a gigantic nuclear exchange. Do such men exist? Even recent history has seen national leaders who are mentally troubled come to power and quickly degenerate into becoming mentally deranged. Hitler would have used nuclear weapons had Germany developed them in time. Other leaders of other countries as well, distinctly paranoid in their thinking, could indeed choose to use nuclear weapons in some last-ditch, self-destructive, suicidal urge. Remember, nuclear holocaust doesn't require a majority of world leaders to be mentally sick; it doesn't even need two of them. One is unfortunately quite sufficient. 3 ) An unauthorized nuclear attack, launched by a group of desperate and diabolical individuals without the government's consent, must not be discounted in this age of rampant revolution and irrational activism. Writing in Commonweal, Dr. Edward S. Boylan, a mathematician at Rutgers University and a consultant on strategic issues to the famous Hudson Institute "think-tank," poses the following frightening scenario: "Suppose, for example, that a civil war breaks out in Communist China, that rebels capture the Chinese ICBM weapons and that they threaten to attack the United States unless it intervenes on their behalf...."
4 ) Even more chilling is the prospect of an anonymous nuclear attack. Here an unknown government could think to gain enormous geographical, political and or economic advantage by triggering a nuclear war between the superpowers (or at least by blackmailing one or more of them). We again quote Dr. Boylan: "One can conceive of a tense diplomatic crisis occurring between the United States and the Soviet Union. A Chinese Communist leader might seek to instigate a war between the two nations by sending submarine-launched ballistic missiles at New York or Moscow [or both].... In a similar vein one can conceive of the White House receiving an anonymous message that unless the United States stops supporting Israel one submarine-launched missile a week will destroy an, American city." 5 ) One nation might think that it could most effectively protect its own vital interests by a quick preemptive strike against any and all real or imagined foes. Such an attack would be designed to destroy the enemy's missiles in their silos on the ground. If such an attack succeeds, half the world dies. If it fails — as it would — everybody goes! 6 ) We haven't forgotten about the poison gas analogy. It is indeed crucial to the whole point. Let's go back to World War II. True enough, poison gas was never used. But had Germany launched her much-heralded invasion of England, that statement would no longer have been true. William L. Shirer, in his classic work, The Rise and Fall of the Third Reich, reports that British plans called for the extreme all-out utilization of poison gas had conventional methods of defense failed — even though such action would have surely meant a brutal German retaliation on the British civilian population. "Had the invasion been attempted the Germans would not have been received gently by the British... [Peter Fleming in his book, The Sea Lion, says] the British had decided... as a last resort and if all other conventional methods of defense failed, to attack the German beachheads with mustard gas, sprayed from low-flying airplanes. It was a painful decision, taken not without much soul-searching at the highest level; and as Fleming comments, the decision was surrounded by secrecy at the time and ever since" (William L. Shirer, The Rise and Fall of the Third Reich, Fawcett Publications, Inc., 1962, p. 1030). In other words, when the vital interests of a nation are being threatened, when that nebulous line "here and no further" is crossed, a nation will use every weapon at its disposal to defend itself. And as more and more countries acquire nuclear capabilities, the number of "here and no further" lines likewise increases. Imagine India and Pakistan, Israel and Egypt, East and West Germany, North and South Korea! — bringing new perils into an already precarious situation. "And except those days should be shortened, there should no flesh be saved: but for the elect's sake those days shall be shortened." In this popular King James translation, the meaning of "saved" is ambiguous. What is meant by "saved"? Spiritual salvation? Or simply, as we have explained here, the preservation and continuance of physical human life? If this verse refers to the spiritual condition of individual human beings during a certain period of history, then the whole prophetic significance would be lost. The original Greek can go either way. The answer must be determined from the context. And the context is very physical. The entire twenty-fourth chapter of Matthew deals with the basic problem of staying alive during wars (verse 6) , famines, pestilences, and earthquakes (verse 7), religious persecution (verse 9) , great tribulation (verse 21) , etc. Consequently, more modern translations emphasize that Matthew 24:22 refers to the fact that human life would literally be on the verge of total annihilation - and this was to be a sure sign that the last days of the end-time generation had arrived. "If that time of trouble were not cut short," begins The New English Bible, "not a soul would be saved alive," continues Moffatt; "not a mortal would survive," states the Berkeley Version of the New Testament; "no living thing would have escaped," paraphrases E. V. Rieu; "no human being would survive," concludes Phillips. We have faced the question: How can we prove that this generation is the end-time generation as described in the Bible when there have always been wars and famines and pestilences and...? Matthew 24:22 gives the answer: The time of Christ's second coming and the end of the present age would occur at a time when mankind would be on the brink of the ultimate abyss of complete destruction. All human life on earth would not only have to be in danger, but in fact, literally about to be obliterated. This is precisely the situation today. It has never been this way before. This is the end time!